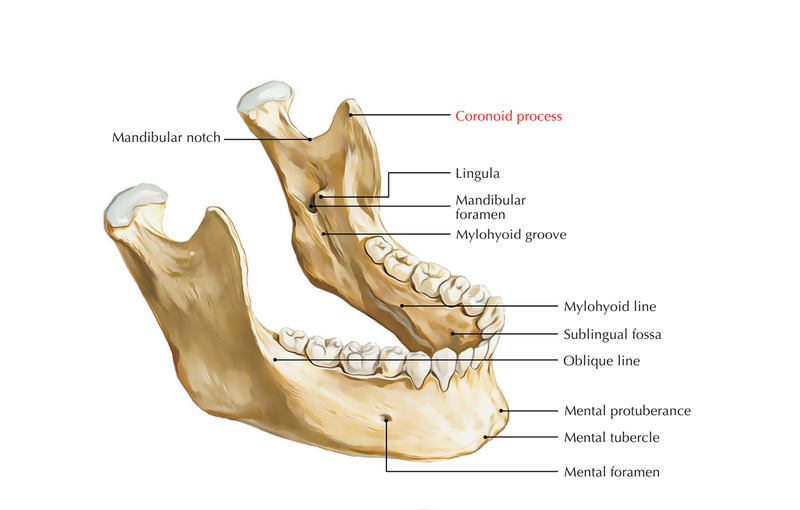 Coronoid process of mandible is a thin, triangular protrusion. It gives attachment to masseter and temporalis muscle. It is flattened from side to side and it is also variable in shape and size. It has convex anterior margin and it is constant inferiorly with the anterior boundary of the ramus. It has concave posterior border and creates the anterior margin of the mandibular notch. The lateral surface is smooth and attaches with the temporalis and masseter muscles. Its medial surface gives attachment to the temporalis and it has a ridge which starts close to the tip of the process and travels anteroinferiorly towards the inside of the last molar tooth. The upper part of which gives attachment to the temporalis. The lower part to a few fibers of the buccinator. Coronoid process is above the level of condylar process in children. Condylar process protrudes above the level of coronoid process in adults. Coronoid process protrudes above the level of condylar process in the old age. One of the most common injuries encountered is mandible fracture. But coronoid process fractures are seen in very exceptional cases. It is anatomically protected by zygomatic arch-temporo-zygomatic bone complex and associated muscles, the isolated fractures of the coronoid process created by direct trauma are rare. Strokes, contusion or penetrating injuries cause most of the fractures.